Isn't it cute? Full post forthcoming. I actually wore outfit 3 (blue top + denim skirt) yesterday to Emily's Scout meeting, it's a great outfit. The big-pocket skirt pattern is by far the big success story, although I like the black one a bit more than the blue. 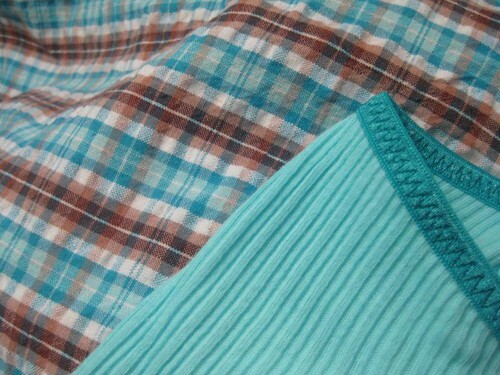 But it's a fantastic skirt and it makes me want to toss all my non-pocketed skirts out the window! The plaid skirt I'm feeling eh on...I love it in theory, I love the fabric but...everytime I put it with a top I don't love it so much. I think I just prefer darker colored skirts. But I'll make myself wear it and see how it goes. No idea on the fabric yet, but I think cherries may be involved. wait...what's that I see? salvage operation in progress! 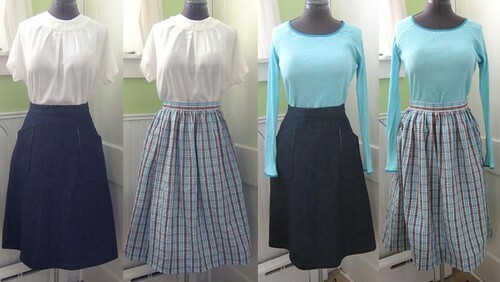 So after yesterday's post, I realized that even if my idea to salvage my cardigan worked, it would no longer match the plaid skirt, so the pieces wouldn't make up a coordinated set. So there was no need to rush things (I found fabrics in my stash and had thought about trying to finish -- more about that below). But then I noticed the top I had cut out and was going to sew while I was working on these pieces was...a perfect match! You'd think I'd have realized I was making another matching piece, since I was using the same thread and all. But somehow I didn't notice until I had put the skirt down right next to it. So, I finished up the top, and I have four pieces! If I get photos today, I will still enter the wardrobe. Not my original concept but....close enough for me to be happy with it. Plus, of course, more clothes that fit! is my bookbinding tape. Vetoed by the family, so no tape-bound cardigan! I'm really warming up to the idea, and I think I may also do cuffs and a narrow binding at the hem so there are no folded-over edges on that fleece. I"m giving it some time off though, no more mistakes please! Now I'm off to get my entry done before it's time for Daisy Scouts! 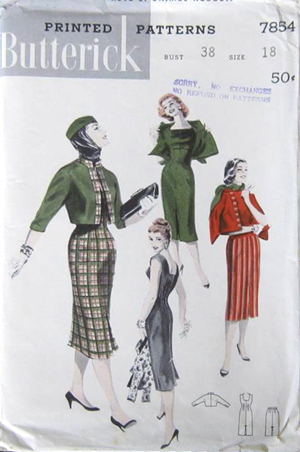 Well, I was in the final stretch of my Spring 1953 mini-wardrobe, and I thought I'd make the deadline (which kept moving -- 14th? 16th? No, it was the 15th). But last night I did exactly what I swore I wouldn't do -- I had a problem with my cardigan (which is otherwise coming out very cute and fits great) and in my attempt to rework the issue I made, um, a huge mistake. 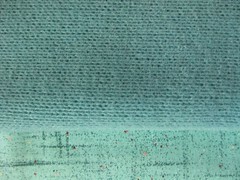 So, what happens when I give away a pattern? I win a new one!! 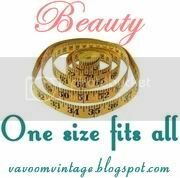 But, as Zoe pointed out to me, upgrading to the things that you will use and that will fit you is a definite positive move. And isn't this dress cute? I want to make it this summer, and definitely in stripes! I also wanted to further the stash busting cause (instead of stash building) by reminding you all of Zoe's fabric swap - de-stash something you won't use and trade for something you will! Also, in the giveaway comments, Caelyn let me know about the Kateri Circle Sewing Group, a women's sewing group at the Pine Ridge Reservation in South Dakota, which can use just about any sewing item you can imagine (there is a complete list at their site). I've already started a box of things to send them. 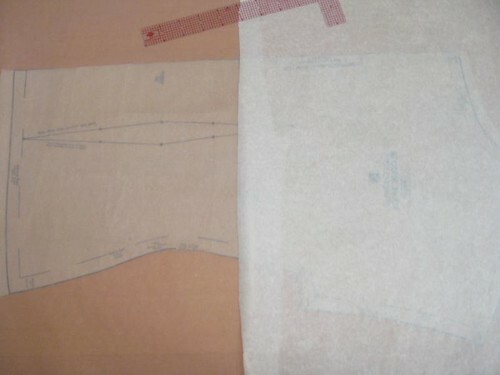 On the right is the standard "pattern tracing paper" I've had for ever. On the left is what I use now, Border & Riley's "Sun-Glo" paper. Super strong, you can write with anything on it, very durable and really, pretty inexpensive. I have the 36" x 50 yard roll and I don't expect to replace it for a long, long time. You can't sew it like you can the swedish-tracing paper type stuff. But for everything else I love it. And now, it's time for me to stop -- it's Saturday and that means biscuit day! I'm off to the kitchen! I have a confession to make. I have been cheating on my mini-wardrobe! Horribly! 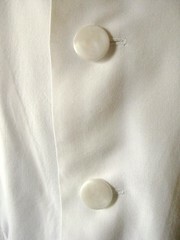 It all started because my jewel-necked blouse gave me so much trouble (actually, they call it "jewelry-necked"). The pattern is fine, but the project was cursed! First my iron coughed up rusty water all over it. I was able to get it out, but when it dried overnight, the dampness from the spot I'd cleaned spread into the entire blouse -- and I'd left pins in a facing. Yes, "rustproof" pins. That rusted. I tried to get that rust out, and ended up with a giant yellow stain. Got that out, ran it through the wash, where it picked up -- can you guess? More rust. Got that out, yellow again, wash again....argh! 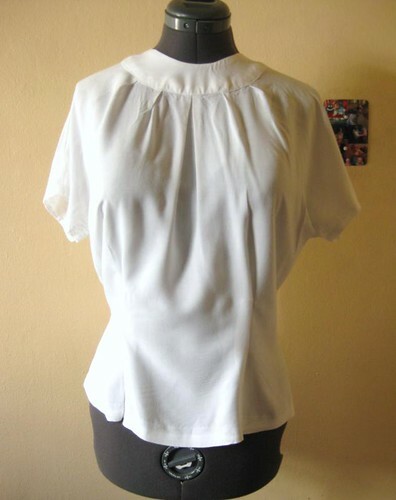 I spent far more time cleaning that blouse than sewing it. It's done now, and very clean. But I don't even want to look at it. So then, instead of working on the rest of the mini-wardrobe, I, uh, didn't. 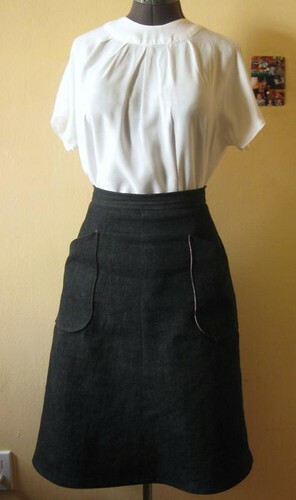 I made my "simple-to-make" skirt out of black denim instead. Not to test the pattern, but just because I wanted a black skirt now! Which I do like a lot, and making the blue one should be a snap 2nd time around, right? 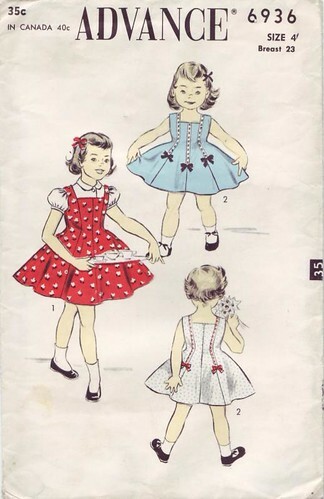 Then, I started tracing patterns for a new top for me, and for Emily's spring wardrobe. 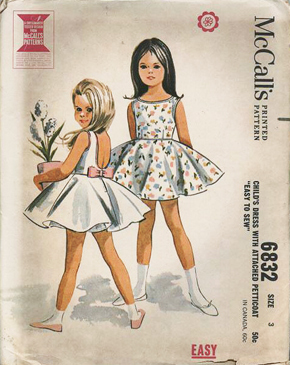 (She's picked some really cute dresses!) Finally last night I did trace my cardigan, and maybe I'll even muslin it today. Or...maybe I'll make my new knit top. We'll see if I can stay on the straight and narrow! Stef! Please drop me a line, Stef, and thanks to everyone else who came to play! I'll have another pattern to de-stash when I make next month's stash busting report, so I hope you try again! On the pattern front, I purged well over 100 patterns last month -- I'm thinking it was close to 200? I don't actually have an accurate count, but I know that well over 120 of them were vintage. A bunch went on ebay, and the rest just got donated to Pattern Rescue. 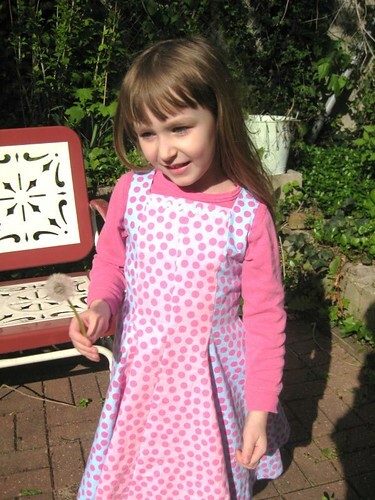 I confess I've restocked a little bit, but the patterns coming in are in my size (or Emily's, or close) and the patterns that left would have never been used. 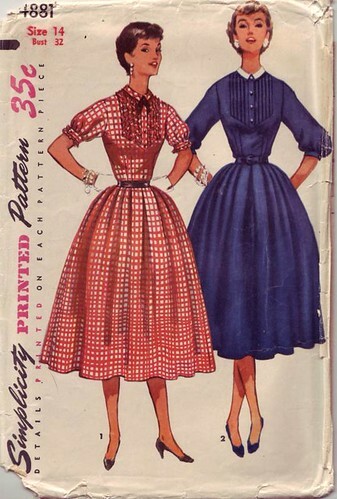 And I certainly have not added anything near 200 patterns! Not even 20. I've also starting scanning all my patterns so I can refer to them more quickly and use them better. As far as fabric goes? I've been keeping a spreadsheet of fabric in and out, and my net for February was -24! Woohoo! 24 yards out, one way or another! But then came March. I had to cash in the gift certificate I won in the wool sewing contest, I put up some flannels for Emily's Fall PJs (Hello Kitty flannel on sale, couldn't pass it up!) 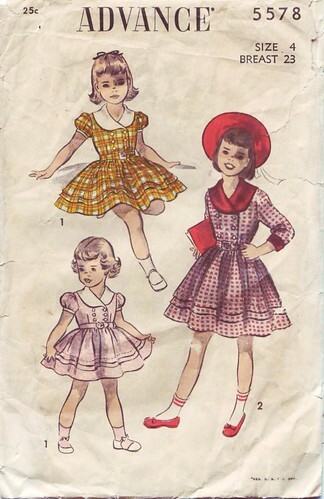 and I needed specific fabrics that I didn't have for the mini-wardrobe contest. 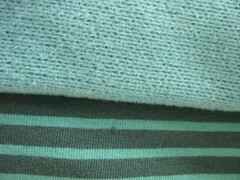 (This is one problem with my fabric, a lot of it was bought for kid's clothes and I can't use it on much else!). And since I didn't get my mini-wardobe done in April...my net is +17. Making my total since I started +7. Sigh. 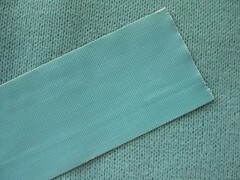 But, a lot of that is already cut out (or even sewn, just not finished), so I'm hoping April's total is a lot better! 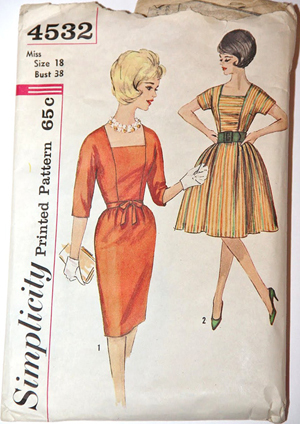 Now, in the interest of reducing, I have a few more patterns I don't need, so here's a lovely Simplicity dress from about 1954, size 14 (32" bust) that can be yours! Just leave a comment and tell me what you've used up or cleared out in the past month from your sewing stash! 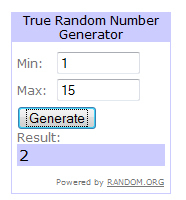 I'll pick a random name next Monday night (okay, well maybe Tuesday morning), so don't forget to leave your email address! (It won't post, don't worry). And don't forget to pop over to Zoe's and sign up to stash bust along with the rest of us!